Maybe I should re-think this "budget cutting" stuff!!! So. It's hot here. It was 108 yesterday, 105 today. As I noted in my video of the day yesterday, I wondered why I was so sweaty when the air conditioner was running and I had even closed the back door, locking the puppies in, but keeping the cool air in. 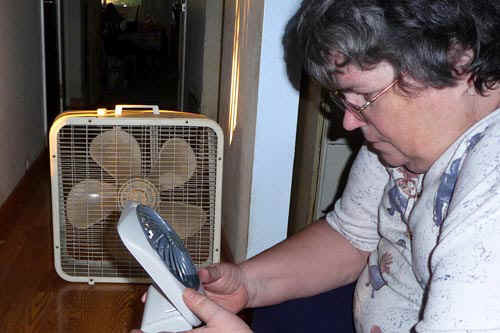 That's when I discovered that the air conditioner wasn't running. The temp in the house was hovering around 90. No wonder I felt so enervated. I was feeling guilty for being just too hot to walk on the treadmill. Well...duhhh...it was 90 here. It was too late to call the heating and air company. I got my new little fan (thank you, thank you, Olivia!) and just sat with that fan and a big fan I brought down from upstairs. Things were fine as along as I didn't move. How hot was it? (I miss Johnny Carson). It was so hot that I didn't feel like eating. That, my friends, was some freaking miracle. 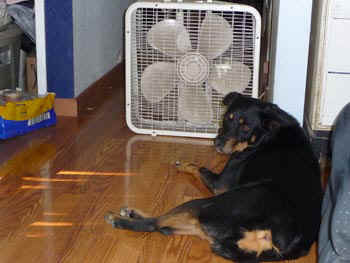 While all the dogs seemed affected by the heat, and none of them wanted to do anything but sleep (Sheila staked out a spot directly in front of the fan; Lizzie chose a cool spot on the bare floor, rather than her usually preferred couch). The puppies had to be in body contact with me. I was practically spread-eagle at my desk, trying to keep them from sleeping on my feet, but they would stretch and stretch and stretch until they were able to touch my feet. I couldn't stand it and finally gave up and moved to the cooler family room (cooler, thanks to 3 fans). I really didn't think I would sleep last night at all, but I kept shooing the puppies off of me and they finally got the message and slept on the dog beds. I had the big fan blowing in one direction, the rotating fan blowing in another, and the personal fan on the table next to me. And I did fall asleep, sleeping almost all night long. This morning, first thing, I called the heating and air company. They could check things out today, but not before noon -- and I had to tell them to come tomorrow instead because Char was coming and we were going to lunch at her cousin's house, and I don't know if I would be home when they showed up. Lunch was lovely--and the chance to spend 2-1/2 hours in an air conditioned environment was wonderful. All the fans were going when I got home, and the house was at 90. As I type here, my fingers are sweaty and sweat is pouring down my face, even though I have two fans pointed at me. The a/c people will be here tomorrow ("but not before noon," was cautioned). Let's just hope they can get something going and that this isn't just the first visit to set up some later more extensive repair.